There is no health without mental health. Mental health is intrinsically beneficial and essential for the well-being of individuals and communities. Mental health promotion focuses on enhancing the social, structural, spiritual and psychological resources that enable one to cope, experience positive quality of life, and contribute to the social, economic and environmental dimensions of society. Promoting mental health provides the capacity to realize abilities, take control of one’s life and make a contribution to society. Mental illness affects one in five Canadians and has a profound impact on individuals and families, as well as exacting costs on society. When people do not feel they belong socially, when they live in fear of violence or bullying in their home, school or workplace, and/or if they are very worried about how they are going to feed and shelter their families, their mental health is often first to be affected. Anxiety and depression can mean less productivity at work, greater use of alcohol and drugs to cope, and can contribute to the risk of chronic physical disease. All of this places heavier demands and greater costs on an already overburdened health care system. The economic burden of mental illness — reflected in the costs to society of health care utilization, lost productivity due to absenteeism from work and long-term disability, and deterioration in health-related quality of life — is estimated to be $51 billion per year in Canada (Lim et al., 2008). Now is the time to take action and move upstream* to decrease the burden of mental illness and assist Ontarians to maintain and improve their mental health. We now have evidence on what leads to positive mental health. The three most significant determinants of mental health are social inclusion, freedom from discrimination and violence, and access to economic resources (Keleher & Armstrong, 2006). Mental health promotion is on the agenda both nationally and internationally and we can learn from the research and experiences of other jurisdictions, as well as build on the momentum in Ontario and Canada. Ontario has been moving in the right direction with the establishment of the Ministry of Health Promotion and the launch of specific strategies, such as the Poverty Reduction Strategy, the Healthy Eating and Active Living Strategy, the Ontario Smoke-Free Strategy, and the Aging at Home Strategy. It is time to move forward boldly to address mental health promotion. The Government of Ontario can play a lead role in setting the agenda, strategically promoting mental health and improving the lives of Ontarians. The World Health Organization defines positive mental health as “a state of well-being in which the individual realizes his or her own abilities, can cope with the normal stresses of life, can work productively and fruitfully, and is able to make a contribution to his or her community” (WHO, 2001, p. 1). Mental health promotion focuses on the whole person, their physical, mental, emotional and spiritual health. Mental health promotion involves individuals, families, communities and the broader environment, with the goal of increasing capacity to improve mental health. Consistent with core health promotion principles, mental health promotion must also promote equity and social justice, and be respectful of personal dignity and diversity (CAMH, 2007; Joubert & Raeburn, 1998). Mental health promotion builds on strengths, empowers individuals, families and communities, and creates comprehensive support systems and environments in which positive mental health can thrive (Willinsky & Pape, 1997; VicHealth, 2005b). Mental health promotion strategies are relevant to all members of society throughout the life cycle, from infants to seniors. People with serious mental illness can also benefit from mental health promotion strategies. A person can experience mental well-being in spite of a diagnosis of mental illness (Pape & Galipeault, 2002). International evidence is strong with respect to the factors that lead to positive mental health, as well as what governments and communities can do to promote mental health. Mental health promotion involves shared responsibility, requiring the active participation of many sectors in addition to health (Hermann, Saxena & Moodie, 2005). Mental health promotion policies and programs must address individuals, their connections within the community and the broader environment in which they live. Ontario needs to act now to address the three most significant determinants of mental health: social inclusion, freedom from discrimination and violence, and access to economic resources (Keleher & Armstrong, 2006). Social inclusion or connectedness is protective of mental health. Having social ties can promote feelings of attachment and companionship, enhancing one’s sense of purpose and self-esteem. For individuals experiencing stress, one’s social network can provide personal support and enhance coping. Social contacts also serve as resources for sharing information that can enhance one’s ability to deal with adversity, therefore moderating distress. Community participation and civic engagement are associated with better self-reported mental health. Participating in social clubs and recreational activities or volunteering can enhance social ties. Civic engagement can impact the social, economic and political forces that can improve one’s life (VicHealth, 2005a). Discrimination and violence are risk factors for poor mental health. Discrimination refers to actions taken to exclude or treat others differently because of their race, ethnicity, gender, sexual orientation and/or disability. Stigma and discrimination against people with mental illness is also a major concern, not just as a risk factor for recovery, but also as a barrier to accessing services and housing. For all thoseaffected, discrimination creates a hostile and stressful environment, resulting in psychological distress and feelings of low self-esteem, control and mastery, as well as anxiety and depression (Rychetnik & Todd, 2004). Discrimination and violence are often linked. Violence is often the vehicle through which discrimination is acted out. Violence can take many forms, including child abuse, neglect by parents, bullying, youth violence, violence by intimate partners, abuse of the elderly, sexual violence, self-directed violence and collective violence (Krug et al., 2002). Being a victim of violence is strongly associated with substance abuse and mental health problems. Access to economic resources, such as housing, education, work and income, is strongly correlated with mental health because it impacts social connectedness and personal sense of competence and control, as well as socio-economic status. These factors are known to both protect and promote mental health (Mulvihill, Mailoux & Atkin, 2001). Economic participation is enhanced by strategies that support life skills and social inclusion, and address systemic inequities. Lack of access to economic resources can result in poverty and material deprivation, sustained hardship and poorer mental health. Investing in strategies and supports that improve access to economic resources and remedy the inequalities experienced by disadvantaged or marginalized populations can significantly increase economic participation and promote positive mental health. A large amount of evidence is already available on actions that can promote social inclusion, lessen discrimination and violence, and increase access to economic resources. The addendum to this paper offers examples of possible options for Ontario. Additional possibilities for action are also possible and should be explored. Diverse stakeholders need to voice their vision for promoting mental health in Ontario. Individuals, families and communities, government agencies with mandates for health, justice, education, environment, finance, housing, employment, training and social services, and the private sector, all have an important role to play. While mental health promotion is everyone’s business, the Government of Ontario must assume leadership in developing a coordinated strategy to increase social inclusion, freedom from violence and discrimination, and opportunities for economic participation; and dedicate appropriate resources to do so. 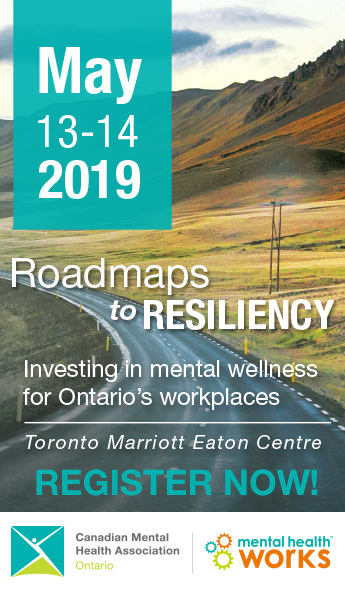 A planned process to convene policy-makers and stakeholders to discuss and determine priorities to promote mental health in Ontario is the next step. * Moving “upstream” refers to taking action on primary prevention strategies to prevent problems and illnesses in a population from occurring later on. Engage and consult with citizens and a broad range of public and private sector stakeholders on priorities for promoting mental health in Ontario. Develop and implement a coordinated strategy to promote mental health in Ontario. Our five provincial organizations have come together to strengthen our collective efforts in promoting and supporting evidence-based mental health promotion strategies. We will support the Government of Ontario in moving forward on this critical agenda and are committed to achieving our vision of positive mental health for all Ontarians. 1.1 Strengthen social interaction for individuals, families and groups in their communities by ensuring access to free space for recreational and other activities. 1.2 Develop activities that involve social interaction as part of the implementation of Ontario’s Healthy Eating and Active Living Strategy. 1.3 Increase structured opportunities for volunteerism and civic participation. 1.4 Create opportunities for both youth and adult participation in arts and cultural activities to foster inclusion. 1.5 Develop culturally-appropriate policies and programs that promote inclusion of new immigrants and refugees in Canadian society. 1.6 Implement the ‘whole school’ approach, protocols and guidelines in Ontario primary and secondary schools. 2.1 Expand strategies and enforce policies to eliminate discrimination associated with race, ethnicity, gender, sexual orientation and/or disability. 2.2 Implement anti-bullying strategies and anti-discrimination programs and policies in schools and the workplace. 2.3 Develop urban planning policies that support a health-promoting built environment. Appropriate zoning, good lighting, well-maintained housing and streetscaping all generate a sense of safety and comfort while spending time in the external environment. Structural changes can also reduce barriers to access. 2.4 Adopt community strategies to address and prevent violence in the community and in vulnerable populations. 2.5 Strengthen programs aimed at positive parenting and developing healthy family relationships. These programs reduce the risk of family conflict, inappropriate disciplinary practices and child abuse. Effective programs also have a demonstrated impact on reducing future risk of substance abuse and mental illness later in life. 3.1 Provide a range of educational opportunities, including literacy programs, job training and job-readiness programs. 3.2 Ensure access to high quality affordable childcare to remove barriers for women participating in the workforce. 3.3 Increase access to affordable housing and safe housing environments. 3.4 Secure an adequate level of income for all Ontarians to ensure food security, education and housing. 3.5 Create incentives and inducements for employers to recruit new Canadians and youth. 3.6 Increase employment opportunities for people with disabilities by enhancing and enforcing workplace accommodation policies. Joubert N & Raeburn J. (1998). Mental health promotion: People, power and passion. International Journal of Mental Health Promotion, inaugural issue: 3. Lim K-L, Jacobs P, Ohimnaa A, et al. (2008). A new population-based measure of the economic burden of mental illness in Canada. Chronic Diseases in Canada, 28(3): 92-98. Willinsky C & Pape B. (1997). Mental Health Promotion, Social Action Series. Ottawa, Canadian Mental Health Association. 1.1 Strengthen social interaction for individuals, families and groups in their communities by ensuring access to free space for recreation and other activities. 1.2 Develop activities that involve social interaction as part of the implementation of Ontario’s Health Eating and Active Living Strategy. 1.5 Develop culturally appropriate policies and programs that promote inclusion of new immigrants and refugees in Canadian society. Weare K & Markham W. (2005). What do we know about promoting mental health through schools? Promotion & Education, 12(3-4): 118-122. Lutzker JR, ed. (2006). Preventing Violence: Research and Evidence-Based Interventions Strategies. Washington, D.C., American Psychological Association. National Institute of Occupational Safety and Health. (2006). WPV prevention programs and strategies. In Workplace Violence Prevention Strategies and Research Needs. Washington. 2.3 Develop urban planning policies that support a health-promoting built environment. 2.5 Strengthen programs aimed at positive parenting and developing healthy family relationships. Barlow J, Coren E & Stewart-Brown S. (2005). Parent-training programs for improving maternal psychosocial health. The Campbell Database for Systematic Reviews, C2-RIPE (social welfare domain). 3.1 Provide a range of educational opportunities, including literacy programs job training and job readiness programs. Raphael D. (2007). Poverty and Policy in Canada: Implications for Health and Quality of Life. Toronto: Canadian Scholars’ Press Inc.
Thoits P. (1999). Sociological approaches to mental illness. In AV Horwitz and TL Scheid (eds. ), A Handbook for the Study of Mental Health: Social Context, Theories and Systems. New York: Cambridge University Press, pp. 129-134. Sheets D & Liebig P. (2005). The intersection of aging, disability, and supportive environments: Issues and policy implications. Hallym International Journal of Aging, 7(2):143-163.